Fiat's sport mark, known as Abarth, may be just what commuters need if they're looking for a sporty, affordable car to spice up their drives into the District. WASHINGTON — Looking for a small car that doubles as a track car? Fiat’s 500 and 124 Abarth models offer affordable fun. Fiat makes little cars. The 500 is a tiny coupe or convertible that’s super cute and comes in a city-friendly size. The 124 Spider is the Italian version of the venerable Mazda Miata with turbo power and a personality that’s more Fiat than Mazda. While the cars are already appealing to those looking for a micro vehicle in which to scoot around the city, Fiat dials in a large dose of sport with the Abarth badge. It’s Fiat’s sport version, so think of it as the AMG you see on sporty Mercedes. Mundane commute? Add a little thrill with this coupe, which has a very different attitude than most daily drivers. This car barks to life and it isn’t quiet, because there aren’t any mufflers to hush this car. Extra power comes from a small turbo four-cylinder engine when you choose the Abarth at 160 horsepower. It might not sound like a ton of power, but this Fiat makes a Mini look large, so 160 horsepower moves it just fine and it sounds really good. Manual or automatic transmissions are available, but the five speed is a bit more fun to drive when compared to the automatic. The automatic, however, is no slouch. I spent some of my drive time on the track for a day of instructive fun. The 500 Abarth is a good entry-level track car. The handling is very good for a small front wheel drive vehicle and it loves the tight autocross course, which is a good place to explore the car’s limits at lower speeds. I also hit the track at New Jersey Motorsports Park and was surprised at the fun I had running around in both dry weather and in the rain. The shifter has shorter throws than other Fiat 500 models, but even still, they’re long and not as crisp as some other manuals I’ve driven. Want to take the next step in handling prowess? 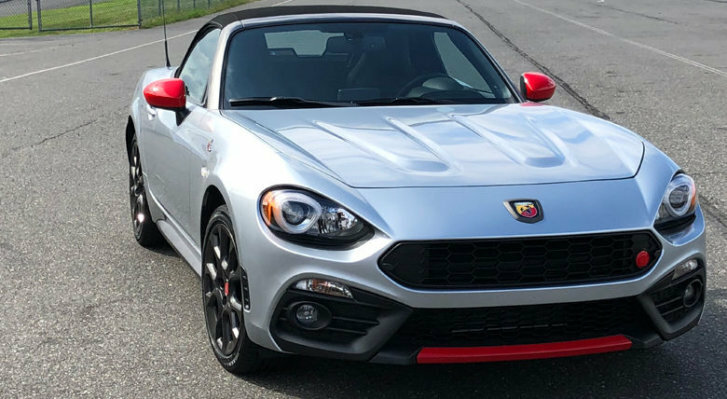 The rear wheel drive 124 Spider Abarth is the Fiat for you. This is a 2019 take on the classic roadsters, but it comes with a warranty, modern amenities and some creature comforts. It was a snug fit in the cockpit with a helmet and driving suit, so if you’re a taller driver who is curious about this car, be sure you think long and hard about your fit. The 2019 124 Spider also has been updated with a larger touch screen and comes with backup camera standard. Recaro seats hug you in place and are good for normal driving. However, there aren’t many adjustments, so be sure you’re ready for the racing seats. Handling is the Fiat 124 Spider’s strength. The little rear wheel drive roadster is very communicative and easy for the driver to understand. The Abarth model has a sportier feel than other 124 Spider models with a tighter suspension. I even think I prefer it over the Mazda Miata, upon which this car is based and shares many parts. The Abarth comes with Brembo brakes that help out on the track, or in the tight spaces that D.C. commuters know well. The brakes felt strong, even after multiple track sessions. Again, this is small car, so there isn’t much weight, and 164 horsepower is just enough to get you into trouble. I sat in the passenger seat for a couple of hot laps with a professional racing driver and was amazed at what the car can do. As cool as the little Fiats are, professional instruction from the Skip Barber Racing School made them a joy to drive fast. One day of classroom and hands-on training helps make you a better driver on the street, too. Need a gift idea for a car-crazed person? A few days at the track might be just what’s needed. The Fiat 500, which starts at $20,500 and 124 Spider Abarth, at $28,000, are two fun machines that don’t break the bank.